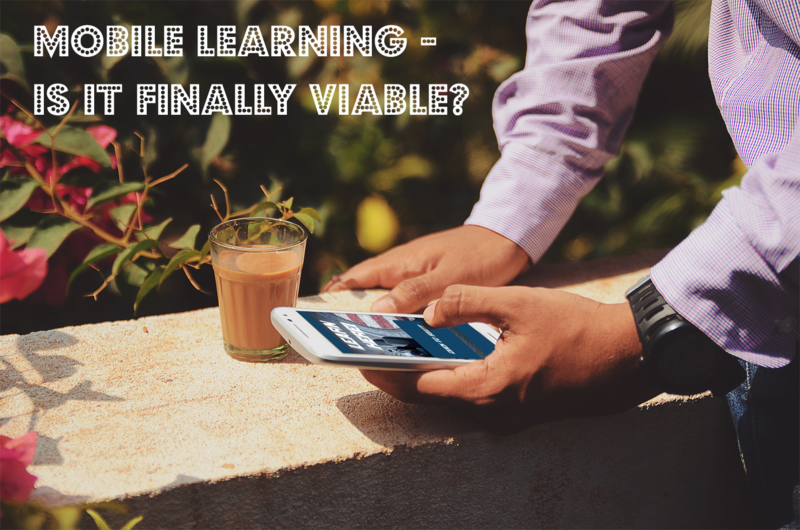 Mobile Learning - Is it Finally Viable? tend to talk about it… a lot. But with new technologies, sometimes you have to stop and ask yourself, is it just being used for the sake of the media itself, or is it actually adding to my blended learning portfolio? If you have read my recent posts, you may already know where I stand on the matter, however, I would like to expand on my previous pro-mobile learning sentiments. Mobile learning reaches the most difficult demographic in all of the learning industry. Who might that be? Mobile learning approaches the traveler, by establishing channels that have never before existed. This rings of significant importance for businesses that are completely structured around a mobilized workforce, as training offerings of the past have seemed like a distant and unachievable possibility. With the only resolution to this issue being to schedule yearly training meetings/events, or requiring intensive eLearnings where the floating personnel is not only taken away from their work, but they are often participating with varied levels of attention and an abundance of distractions. But now, everything that is required for proper learning and accreditation is right there at your fingertips, just a few screen clicks away from impacting organizational wisdom, verifying departmentalized compliance, and actually engaging these hard to reach people. We as learning professionals already know that eLearning being ported to mobile for the sake of technological availability is not in itself an efficient utilization. Instead, effective content is and must be designed specifically for use on our handheld devices and tablets. More and more instructional designers and content providers are specializing in this medium and as the technology around them gets better Mobile Learning itself will continue to improve. As it is now, there in an abundance of quality mobile content on the market, with enough customization to suit your organizational needs. That being said, be sure to continue monitoring industry trends as this content will continue progress with the inclusion of mixed media, as well as utilizing new ways in which we interact with these mobile devices in general (Virtual Reality, Augmented Reality, and maximization of specific phone capabilities such as the long press and onboard motion controls come to mind as immediate examples in this category). Why should I want to participate in this learning exercise? One of the key features of Mobile Learning is the briefness of the media. Due to competing elements on the phone and how much time people on the go have in between events, the content is forced to be concise. Brief, engaging and sometimes gamified content are strides ahead of where they were just a few years ago. Currently, the motivational aspect of mobile content is more than enough to provide a significant learning experience for your workforce. Combine this sentiment with the inclusion of social platforms, and you have all the makings for a solid learning alternative that can take a fledgling program and produce something that is incredibly viable and sustainable. Learning and Development must first address what they wish their personnel get out of their mobile learning programs. The intent of the mobile learning exercise is very important to establish prior to the implementation of a mobile program and inclusion into a blended learning environment. Mobile learning can be used in a variety of ways, it can be used as a sole source of information directly to a learner, it can accommodate the message of a long-standing eLearning or Instructor lead training, or it can be used simply to certify an employee who has undergone necessary training in their required field. Contextually, we are at the point where learners are the focal point of the process. Content exists in all the pre-mentioned categories, and if applied correctly and displayed in captivating enough manners, can advance the output of your learning program leaps and bounds beyond what was previously achievable. It would be careless to exclude this category from the overall list of Mobile Learning, as it currently stands. Perhaps the newest topic on this list, but is already offering immense benefits to the field. A quick definition of microlearning is that of a brief (less than 5 minutes) learning component with a focus on a very particular learning object (specifically a skill, behavior, or compliance piece). These are currently best executed in a mobile environment, as they’re quick to develop and complete, as well as their hyper focus on a specific topic allowing for the greatest utilization of Mobile Learning practices and features. If you are looking to dip your toes in the Mobile Learning waters, in order to evaluate the potential benefits, it could be done very effectively through the inclusion of microlearning in your overall blended offerings. In short, Mobile learning is really starting to gain a foothold in the industry and a vital part of a well-rounded blended learning environment. Be sure to keep up-to-date with impending industry trends as they could immediately impact not just the effectiveness of your program, but also the methodology. Please consider joining me as I further investigate this fun and unique space, as well as leave feedback if you have another impactful argument which I may have missed.